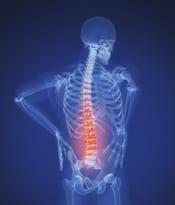 Facet-joint injections are both a minimally invasive treatment for back pain caused by inflamed facet joints, and a diagnostic tool for determining whether facet-joint inflammation is a source of pain. Four facet joints connect each vertebra to the vertebra above and below it. A facet-joint injection, administered into either the joint capsule or its surrounding tissue, combines a long-lasting steroid and a local anesthetic. Although the anesthetic provides only temporary pain relief, the steroid reduces inflammation, and can relieve pain for anywhere from a few days to a few years. Lasting pain relief is diagnostically significant because it confirms that the pain originated in the joint that received the injection. Facet-joint injections can be repeated up to 3 times a year for those who have successful but short-term pain relief. Facet-joint injections are often recommended after anti-inflammatory medication, a back brace or other conservative methods have failed to alleviate symptoms. A patient who is pregnant, has an infection, or suffers from a chronic bleeding disorder is not a candidate for facet-joint injections. During the procedure, the injection site is first numbed with an anesthetic. The needle is then inserted directly into the facet joint through the back; fluoroscopy, an imaging technique, is used to ensure precise placement. Once the needle is correctly positioned, a combination of anesthetic and cortisone is injected into the targeted joint. The procedure takes less than 30 minutes to perform. There is immediate pain relief from the anesthetic used in the injection, but it takes several days to determine whether the cortisone has had an effect. There may be mild pain at the injection site; it can be managed by taking Tylenol and applying ice. A patient can return home shortly after receiving an injection(s), and can resume regular activities the next day. A follow-up visit to the doctor takes place in about a week; an evaluation is made of how effective the injection has been in lessening symptoms. Results of facet-joint injections vary widely. Some patients experience long-term, even permanent, pain relief after one injection, whereas others may need additional treatment within a few weeks or months. Although considered safe, there are risks involved with facet-joint injections. In rare cases, they can cause infection, allergic reaction, bleeding or nerve damage.